I’ll be flipping the boat over tomorrow morning at 11 a.m. I’ve invited most of my friends to come over to help out. 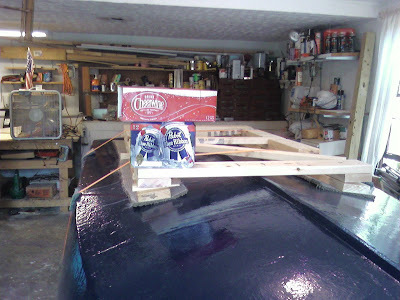 I figure I need about a dozen strapping helpers to flip the 750-pound boat over. How will I entice these people? A perfect combination of Cheerwine and Pabst Blue Ribbon. If you’re in the neighborhood, feel free to stop by. We’ll be enjoying some pulled-pork barbecue afterward. I’ve built a simple cradle for the boat to sit on when it’s ride-side up. I didn’t build anything for the sides, so we’ll need to make sure we don’t put too much weight on the side as we tumble her over. I have used tires standing by — to soften the roll. Hopefully, all will go well. I’ll post pictures later and mayhaps even a little video.